Family condo w/ balcony & shared pool - beach across the street! Property 8: Family condo w/ balcony & shared pool - beach across the street! Property 9: Beautiful family condo with full kitchen and free WiFi - steps from the beach! Enjoy And Relax Padre Style. A Must Have Condo With The Feel Of The Island! Property 10: Enjoy And Relax Padre Style. A Must Have Condo With The Feel Of The Island! Beachfront complex!!! Fully remodel condo!! Property 17: Beachfront complex!!! Fully remodel condo!! Adorable Ocean Front Condo with Pool! You can't get any Closer to the Beach than this! 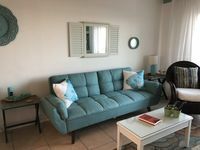 Property 19: Adorable Ocean Front Condo with Pool! You can't get any Closer to the Beach than this! Spacious Luxury Bayside 2b/2b With Boat Dock Next To Birding Center. Property 21: Spacious Luxury Bayside 2b/2b With Boat Dock Next To Birding Center. Family Fun or Romantic Get-Away steps from the beach! Property 22: Family Fun or Romantic Get-Away steps from the beach! Property 31: Beach life living!!!! 3BR/2BA Condo - Great location! April Specials! Property 33: 3BR/2BA Condo - Great location! April Specials! Classic condo with a balcony, shared pool & hot tub - steps from the beach! Property 34: Classic condo with a balcony, shared pool & hot tub - steps from the beach! Fresh, clean and close to the beach! Property 43: Fresh, clean and close to the beach! Wonderful condo with a great location! Only reason for one star reduction was being on the 3rd floor with no elevator. It was ok for us but older folks might have an issue. This is nothing the owners can do anything about other than disclose. Other than that, we would not hesitate to rent again, Thank you so much! Condo is in a perfect location for exploring everything the island has to offer. Clean and well-stocked with everything you need to enjoy your stay. Beautiful view of the ocean from the balcony.